TradeMe pick up & delivery, household relocation,office relocation, new furniture delivery,dismantle and assemble. Temporary Storage. Wide wellington areas, able to do house relocation in North Island. available 7 Days, able to plan time with you. single item pick up from $40, charge based on locations and size and weight of the item. Mon- Fri, $90+gst per hour, Sat & Sun & public holidays, $100+gst per hour, (two men and a truck). Mon- Fri,$110+gst per hour, Sat,Sun & public holidays: $120+gst per hour (two men and a truck).no call out fees, no hidden additional cost. 2hours minimum charge apply for all trucks. Packing service is $100+gst per hour including packing materials: boxes, wrapping, sealer tape etc. We're able to give fixed rate instead of hourly charges for long distance move,(out of town) We can provide free quote if you are local. *we are able to move upright pianos with easy access, we will not risk taking piano from/to places have more than 10 steps.And additional charge may apply for moving piano or objects similar weight. For moving insurance, we can only provide coverage for lost items and intentional damage not mishandling. We will deliver the furniture you buy from our shop for free when you choose us for relocation, please see our other listings. Probably the best EVER moving experience. From booking it in with Rachel right through to the actual moving of the furniture and the storage at their depot it was a breeze. Pricing rates are the best in town and you won't be disappointed Highly recommended. Great service - punctual, good communication, piano moved carefully with no issues. The guys had a great sense of humour and the price was unbeatable. Absolutely fantastic! We had a great move from Island Bay to Wainuiomata. Our stuff was moved swiftly with no damage to anything. Particularly impressive as the Island Bay property had very long narrow stairs and previous movers had damaged items and knocked out a window (not blaming them, it is difficult to navigate, but these guys handled it with no trouble). Highly recommended! Our moving request was quoted quickly and the service from the movers was very efficient and met our requirements. Thank you for a job well done. Got Hutt Movers to shift our HEAVY piano. They were awesome from the prompt response from Andy in booking the job, to Rachel keeping us updated about timing to the top men who did the grunt work up multiple steps. Great Company highly recommended. These guys were awesome!! They were on time, carefully shifted our household items to our brand new home at a reasonable price. Awesome! 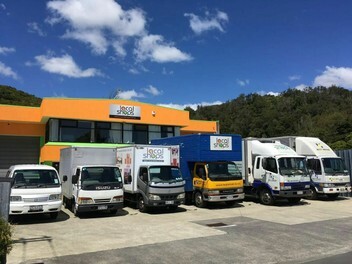 The team at Hutt Mover are friendly and efficient. They helped us with a move out of our apartment into our new home. The guys they sent were awesome to deal with, and the team at the office were also very accommodating and great to deal with via phone and email. The plastic crates they can loan you are also extremely useful, far better than cardboard boxes. Thanks team! Great guys and efficient on successfully moved us over the weekend. Great service all round from booking to completion! Andy: Thank you very much. Have a nice day. Your level of service exceeded my expectations. Both Anthony and Kelvin did a fantastic job in moving our stuff. They arrived sharp on time. They are very efficient, quick, strong, friendly, professional and very careful with our stuff. They also made sure they don't damage the houses when moving heavy stuff. You deliver your service to perfection!! The blue boxes were very handy. I would highly recommend you to anyone and will definitely use your service in the future. Thank you so much. Super efficient, prompt and polite. They couldn't have been better. Great movers! Andy: Thank you so much. Have a nice day. Hi Andy I was so impressed with your efficiency, communication and professionalism. I will certainly recommend you to friends and family. Thanks again. We've used Hutt Movers 3 times now and highly recommend them. Aaron and Junior were great, an absolute asset on moving day. Fantastic, efficient and friendly service from Hutt Movers. We can't thank you enough for your help on moving day. Would definitely use again and recommend to others. These guys are great. Super easy to deal with, respectful to our belongings, clean and efficient. The blue boxes free of use were a great help also. I would highly recommend and will be using again in the future if the need arises. Thanks! Just wanted to say a massive thank you for your service getting my stuff up to Auckland. The guys were great, friendly and fast. Everything got here in one piece. You did as promised. these guys Aaron steve turned up on time very profesional curtious really helpfull especially with the stairwell chair getting fridge past it no hassel quick operaters,thank you so much will def use this company in the future.also booking truck was no hassel when i first made contact all the best for the future.regards stuart. [kelson to high street lower hut]. Andy: We are so happy to hear that, thank you very much Stuart and hope we can help you again in the future.